This will be a great fun night of paint pouring and supporting the unique Australian youth-led development organisation, Oaktree. The majority of all proceeds go directy to Oaktree. You will be shown the techniques to do your own paint-pour using flow mediums, bright acrylics and silicon oil. Then you will create your own canvas panel. Finally you will join in a group to create a large canvas which we will be auctioned during the evening. Included in the one price is a stand up dinner with platters of food arriving throughout the evening: think lamb kofta, sliders, arancini balls, the list goes on. There will be gluen free and vegitarian options. We are a B.Y.O venue so bring along a few drinks for the evening. Absolutely NO painting experience required. 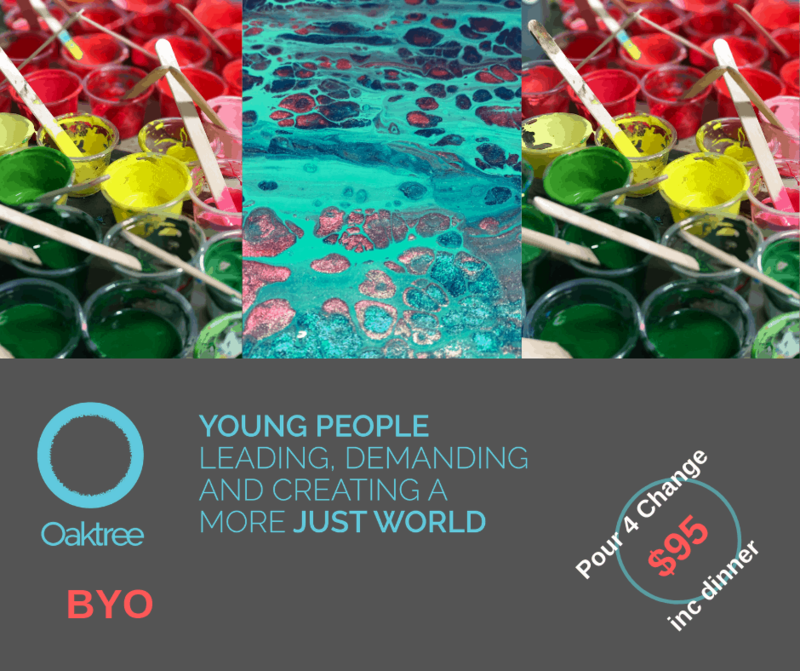 Oaktree is Australia’s largest youth-led international development organisation; the funds raised by this event will support Oaktree’s overseas partner organisations in the Asia-Pacific and all Oaktree’s domestic youth empowerment work. That’s money going towards education programs and upskilling young people in Cambodia, Timor-Leste and at home in Australia. Why education programs? We believe in the transformative power of young people and the life-changing impact education can have. Education empowers people to break out of the poverty cycle once and for all, and we like the sound of that. Please arrive at the Montague Hotel at 6:15pm for a 6:30pm start.